Drs. Paul and Anita Gill can reshape your body with targeted CoolSculpting sessions at The Gill Center for Plastic Surgery and Dermatology in The Woodlands, TX. As one of their most popular nonsurgical treatments, CoolSculpting is the only FDA-cleared procedure to use controlled cooling (cryolipolysis) to safely eliminate tough fat you just can't seem to lose with diet and exercise. We offer CoolSculpting to men and women who do not wish to have more invasive procedures and it is not to be used as a method of weight loss if you are obese. Come in for a consultation to see if you qualify for specific fat reductions in areas with a little pudginess. Schedule an appointment for more information about CoolSculpting and find out if this treatment is the right one for you. "I recently had my first fat freezing (coolsculpting) treatment on my double chin. It was such a hit, I have my husband and sister already scheduled for theirs. The whole process from the consult to treatment was smooth, I was able to get in quicker than planned after hearing I need to be completely ready for a Christmas event. Thank you ladies for making feel so comfortable, we will be seeing you again soon!" Following your initial consultation with either Drs. 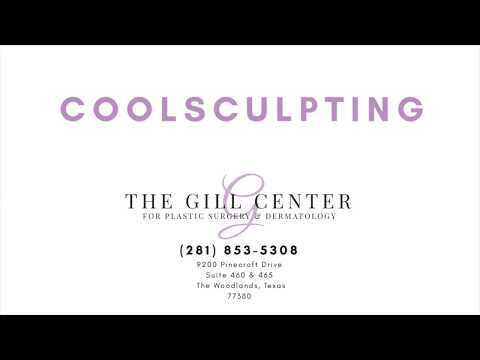 Paul or Anita Gill, you can schedule your CoolSculpting treatments at The Gill Center for Plastic Surgery and Dermatology. During your session, the CoolSculpting handpiece is used on the chosen area and the cryolipolysis process will start. The cooling technology, delivered by the applicator, will begin to attack and deaden the fat. You will likely experience a cold sensation at the time of your procedure, but this does not typically create pain. Because the CoolSculpting applicator uses suction to move the targeted fat cells toward the predetermined treatment area, you will likely experience a small amount of pulling or stinging, but these are normal sensations. Since CoolSculpting is noninvasive, you can expect to return to daily activities following your procedure. In most circumstances, patients can return to school or work immediately after their treatment. Symptoms of the treatment can include bruising, stinging, redness, swelling, and discomfort of the treated site. These symptoms are short-lived and usually fade in the days after your treatment. Expect to notice results within three weeks, while you will see the most obvious and dramatic results 1 – 3 months following your CoolSculpting procedure. How much will CoolSculpting cost? The expense of CoolSculpting varies based upon the number of sessions recommended and the quantity of fat that you wish to have removed. At your consultation, we'll discuss your cosmetic goals to decipher the most appropriate course of action to achieve those results. We'll also speak with you regarding any out-of-pocket expenses. CoolSculpting is a minimally invasive, topical procedure where the apparatus is applied to your skin’s surface. With this procedure, there's absolutely no need for a healing period. You might notice some minor swelling and discoloration immediately following the session, but that usually subsides in around one week. The number of sessions required to attain your desired outcome will be determined during your consultation. For many patients, just one treatment is sufficient, while others might require more therapy sessions, depending on the quantity of fat being addressed. The number of sessions depends on your aesthetic objectives and if you have larger layers of fat in target sections. Can my fat cells grow back? While the affected fat cells will not regrow, brand new fat cells could form. In addition, weight gain can greatly influence your results. So in order to keep your desired effects, it's necessary to stick to a proper diet plan and workout regimen. There is no such thing as the perfect body and each of us has things we wish to change, such as specific areas of fat that will not respond to exercise and a healthy diet. Due to technological advances, it is no longer necessary to decide between dealing with the undesired fat and liposuction. The Gill Center for Plastic Surgery and Dermatology is excited to offer The Woodlands, TX men and women CoolSculpting treatments. We extend consultations for CoolSculpting in our The Woodlands, TX office that can be scheduled at your earliest convenience. Book a consultation with Drs. Paul or Anita Gill to find out if you qualify for CoolSculpting or whether a different treatment would better meet your aesthetic goals.